For over a decade, Welsh “active clothing” company Howies has been churning out a product mix that sees their raw, selvedge denim merchandised side-by-side with their in-house line of everything from merino base layers to cycling bibs. An eclectic combination like this isn’t often seen in the raw denim industry, as the only other blurring of the lines between sportswear and workwear that springs to mind would be Japan Blue‘s Freedom Jeans. Following our curiosity we take a look at what drives Howies and illustrate why we’re happy to be taken along for the ride. Much like the rest of the raw denim industry, Howies is founded on an ethos of quality. But what their small, and rather sports crazy, team are doing in order to distinguish themselves and their product from the rest is part of a bigger picture of sustainability. According to their website, from start to finish the production of an average pair of jeans consumes around 6,000 litres of water. The team are channeling their eco-friendly tendencies by holding one priority above all else; to use less water. 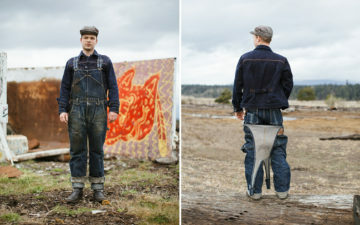 In order to chase this goal, Howies constructs two thirds of it’s line up out of Cone Mills Sustainblue denim, an environmentally conscious collection debuted by Cone in early 2012. Sustainblue denim comprises a unique blend of recycled cotton and other sustainable yarns; a mix that Howies claims uses “10 – 20 times less water in production than pure cotton.” The brand also offers an interesting pair of Soda Pop jeans, made using a Cone Mills fabric that contains up to five recycled bottles per pair or jeans. Let’s take a step back and look at this “bigger picture”. There’s not a whole lot that’s new, right? We’ve seen initiatives like this before; the Levi’s Waste<Less campaign, while not being the first eco-friendly denim line-up, certainly generated enough buzz to spur other large label’s into action and now even Pharrell Williams is having his two cents on the topic. Now I can’t speak for Mr. Williams but the idea behind raw denim, for a lot of us at least, is to tell a story. To honour and refloat a craft that’s been around for longer than us all. A story of wear. In essence, to be a part of a bigger picture, whatever that picture may be. 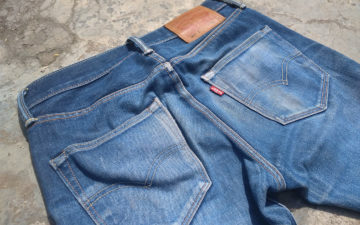 To some of us, that might mean supporting Japanese artisan craft; others get excited by the fact that the jeans they’re wearing are minutely identical to those produced a century ago. But despite the already intense variation in lifestyle and motivation, it’s still so predictable that movements establishing a picture of sustainability and environmental awareness will be shot down, sucker punched across the internet forums, by keyboard warriors resilient, not even to change, but to new ideas. Because, and this is the truth, movements like this won’t bring change. We’re not about to get up off our hidden rivets and trade in the heaviest, slubbiest of all Momo‘s for a model that simply saves water; no offence intended, just as we didn’t trade in our Ford Expedition the second the Prius hit the market. But simply because this pair doesn’t resonate with us is not to say that we don’t appreciate and respect the motivations behind anyones decision to wear the product. And it is exactly this appreciation that the denim industry needs more of. Too often do we make snap judgements. Opinions formed in seconds, only to be broadcast to the web through a blog or forum post, can result in catastrophe for both the brand, and the community. Each denimhead is now discouraged from buying the product for fear (and this is legitimate) of not being accepted. 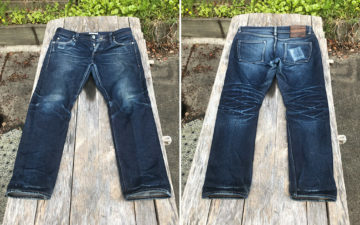 Although not exclusively, because of this mentality that anything different isn’t “true raw denim”, people tire. People get discouraged. A lot of consumers never even venture into the world of premium denim. Even more so when niche gateways (entry level priced jeans, Kickstarter and eco-friendly initiatives that appeal to a new market etc.) are shot down. This is exactly what brands like Howies create: gateways. Opening up the raw denim community to a plethora of excited, eco-friendly individuals who may not have otherwise stumbled upon this phenomenon. As said before, the world of raw denim is a chance to be a part of a bigger picture. And whether that picture is to support eco-friendly tendencies, or, more conservatively, to honour a century old industry, participation should be encouraged. To sum everything up, despite the fact that Howies ideals could be considered a little ‘been-there-done-that’, we applaud their perseverance to keep the eco-friendly spark alive amongst the raw community. And whilst it’s easily foreseen that these types of initiatives may be brushed off as not being completely authentic, we support the idea that one person’s dehydrated jeans might be another’s rope dyed loomstate.